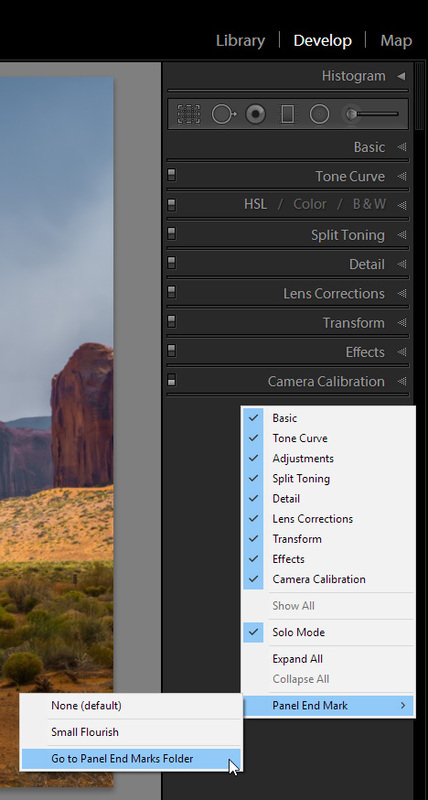 Here is the graphic I created in Photoshop where I listed my favorite Lightroom shortcuts. 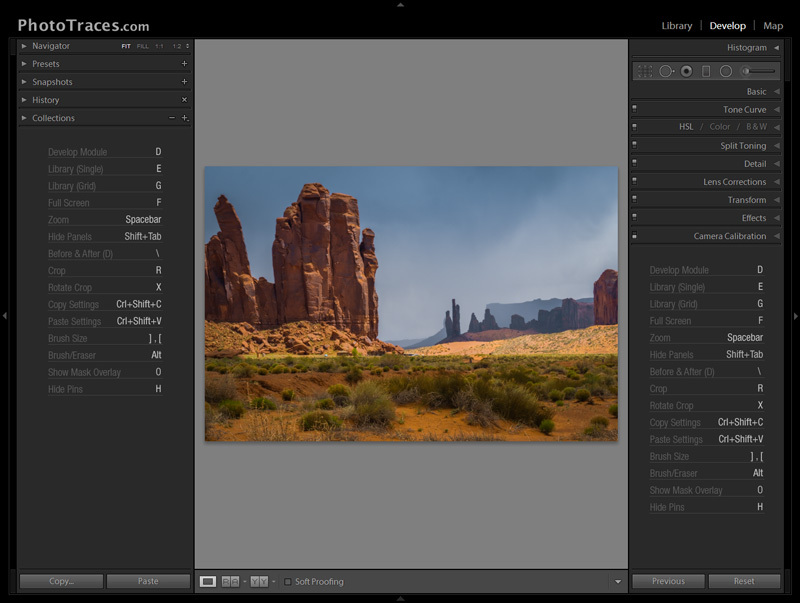 This is how it looks after I installed it in Lightroom using the little-known Panel End Mark feature of the application. This feature allows users to add any graphic—in PNG format—and set it to appear on every panel (left and right) of each module. 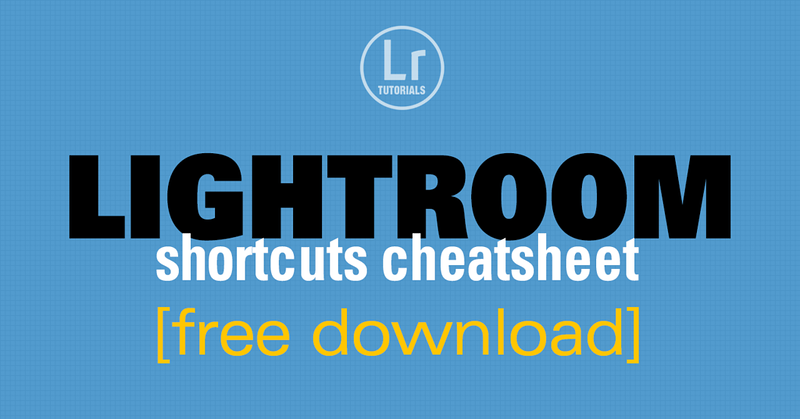 Below is the 3 step installation process to bring Keyboard Cheatsheet into Lightroom. Feel free to use the images I created or use your own by following the installation steps below. Right-click (Option-click) to download the appropriate version below. Save it to your computer. 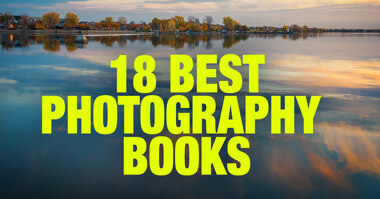 These are PNG images with the transparent background. Right click (Control-Click) at the bottom of the left or right panel in any module. 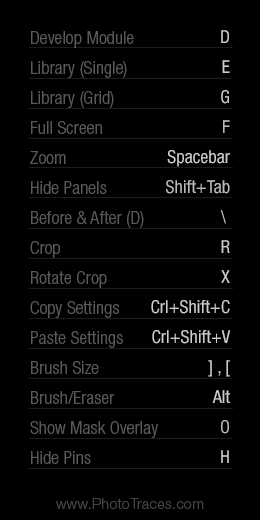 Now you have a new option under Panel End Mark menu: LR_Shortcuts_Cheatsheet_WIN.png or LR_Shortcuts_Cheatsheet_MAC.png depending on what version you downloaded. Select the image name of the graphic you copied to Panel End Marks Folder in step 3 and it will appear at the bottom of the panels. 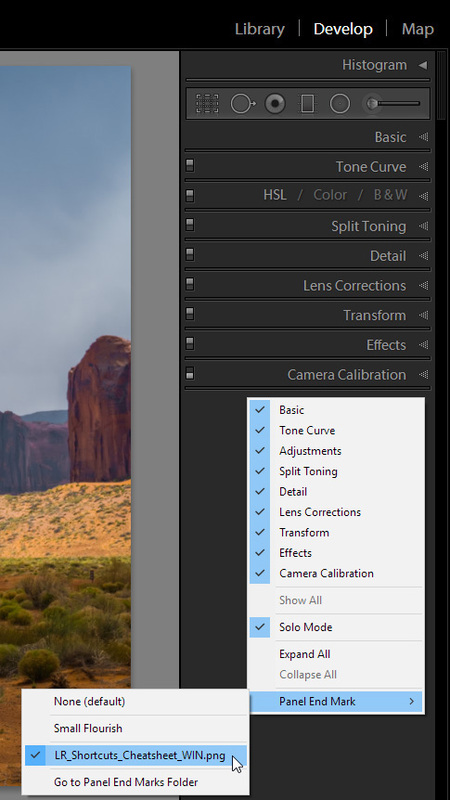 The Lightroom Shortcuts Cheatsheet appears on both panels in every module. What a great little freebie, and so damn useful. 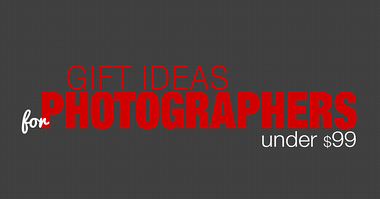 I have shared this on one of my facebook groups as a thank you for a great idea! tip: you can also istall it via Edit-Preferences-interface-Panels-Endmarks-drop down and select “go to end marks folder”-drag and drop your PNG into it- shut down Lr and then restart, do the same upto drop down- then select the png shortcuts and voila! it’s on the end mark places on LR! Thanks Victor. In theory, this looks like a good idea, as a way to try to adapt to Keyboard shortcuts (I nearly always just use the mouse, but read other experienced Lightroom (and Photoshop users) say it’s much quicker to use the Keyboard. 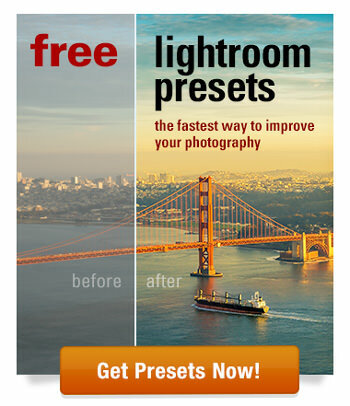 I’ve set it up, but will wait now until another day, the next time I open Lightroom to try it. What a great idea. There are so many hidden gems in LR . . . I was going to change to a competitor but then found out I couldn’t put my logo on exports, merge panoramas, or do a lot of other little (but important) actions that I have come to depend upon. Every time I read a “hints on LR” I find something else I didn’t know about. Yesterday was an explanation of how the graduated filter actually works, today your shortcut help. Sorry but I can’t find the download link?? Note: To do what Viktor says below, right-click on the bottom of the side panel in the module selected and a small un-named menu appears with the words: Panel End Mark at the bottom. In the menu, slide over and put the cursor on – Panel End Mark- You will see the choices, which will include the .png file you just placed in the Panel End Marks Folder. Select it. Lo and behold the cheat sheet will appear as the last part of the panel showing the CheatSheet info and Keys to tap. It works.